May 29 is Memorial Day in the United States. It is a federal holiday dedicated to remembering those who have died fighting for America while employed in the armed forces. Other ancient cultures that practiced grave decoration include those of Java, China, Surat, and Libya. These traditions usually occurred in spring and may reflect aspects of pagan rebirth festivals found globally around this time. Soldiers graves were decorated prior to the Civil War, but the formalization of the practice occurred after the devastating war. Over half a million Union and Confederate soldiers died during the Civil War. According to Wars within a War: Controversy and Conflict over the American Civil War, the federal government began creating national military cemeteries for the Union war dead in 1865. The decoration of these graves was spearheaded by women. However, some Southerners claim that Civil War grave decoration began in 1861 in Warrenton, Virginia, writes The Richmond Times-Dispatch newspaper in 1906. Another unsubstantiated claim includes that African-Americans started the tradition in Charleston, South Carolina, on May 1, 1865, writes the Charleston Daily Courier the New York Tribune. Whatever the case, the “official” birthplace of what would become Memorial Day is Waterloo, New York. 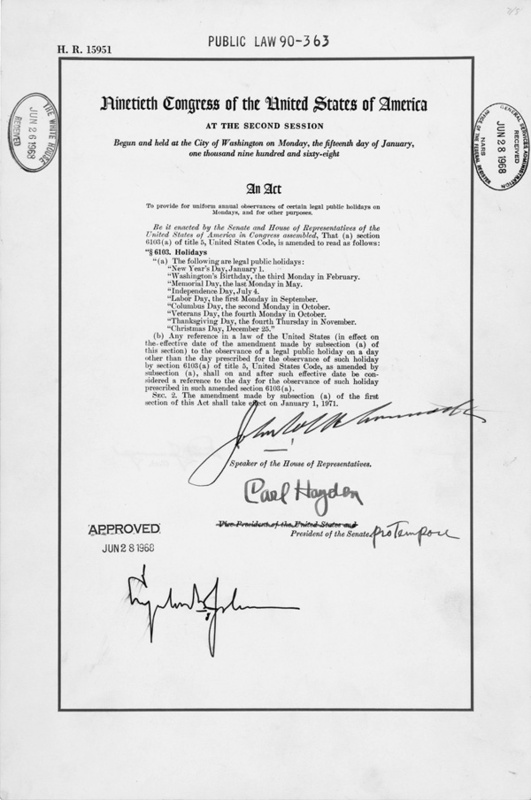 It was signed into law by President Lyndon B. Johnson in 1966 after a Congressional resolution. Columbus, Miss., was a hospital town, and in many cases a burial site, for both Union and Confederate casualties of Shiloh, brought in by the trainload. And it was in that Columbus where, at the initiation of four women who met in a 12-gabled house on North Fourth Street, a solemn procession was made to Friendship Cemetery on April 25, 1866… As the story goes, one of the women spontaneously suggested that they decorate the graves of the Union as well as the Confederate dead, as each grave contained someone’s father, brother or son. Other stories of its emergence vary, but all include that the idea began with women. Another common origin of Decoration Day is Columbus, Georgia, which holds its inception about a year earlier than Columbus, Mississippi on April 16, 1865, writes The Myth of the Lost Cause and Civil War History. The Civil War officially ended on May 9, 1865. However, the last battle of the Civil War was the Battle of Palmito Ranch in Texas on May 12 and 13. The last significant Confederate active force to surrender was the Confederate allied Cherokee Brigadier General Stand Watie, the only Native American general of the Confederate Army, and his Indian soldiers on June 23 in what is now Oklahoma. On May 5, 1868, commander-in-chief of the Grand Army of the Republic, the veterans’ organization for Union Civil War veterans, General John A. Logan proclaimed that “Decoration Day” be observed annually and nationwide, writes Decoration Day in the Mountains: Traditions of Cemetery Decoration in the Southern Appalachians. It was observed for the first time that month on May 30. The date was chosen because flowers would be in full bloom. After Logan’s proclaimation, states soon adopted the custom. The name slowly changed to “Memorial Day” in 1882, writes The Good Fight That Didn’t End: Henry P. Goddard’s Accounts of Civil War and Peace, but it didn’t become completely standardized until after World War II. Eventually the name and date of Memorial Day was solidified on June 28, 1968 with the passing of the Uniform Monday Holiday Act by Congress. The act created the three day weekend. On Memorial Day, the flag of the United States is to the top of the staff and then lowered to the half-staff. It stays in this position until noon and is then raised to full-staff again, according to U.S. law. This flag ceremony is usually held at cemeteries where veterans and families gather to honor the fallen and deceased. Parades are also held. Following the publication of In Flanders Fields by Lieutenant Colonel John McCrae during World War I, silk poppies are worn in honor of those who have served and paid the ultimate sacrifice.